Came off as kinda desperate to me. Hopefully they don't screw it up. My guild promotes people who contribute to the guild - high raid performance, updates with news, TW organisation (my job), or just people who generally just engage with each other in the chat. We haven't promoted anyone for a while though. If their shiny new P2P character breaks their shiny new-ish raid they'll increase the health pool/defence/whatever of the bosses and not tell us. I believe Filoni said that both Ezra and Thrawn are still alive after Rebels, so they'll both definitely come back in one form or another, be it TV, movie, video game, comic, whatever. We'll probably get him leading up to Rise of Skywalker, but then again, we may get a new Palps/rework/re-tagging of Palps. Same thing happens with Old Ben's mind tricks. There was recently a thread to do with Ezra's assist being countered. Something to do with it being done on his turn or something, I forget. I always distinguish the three different versions of Anakin as Anakin (Jedi), Lord Vader (pre-accident), and Darth Vader (post-accident), despite mechanoid Vader being called Lord Vader too. I'd go with Cad over Greedo. Yeah, they both remove buffs and have decent damage, but Cad looks cooler and has the ship. 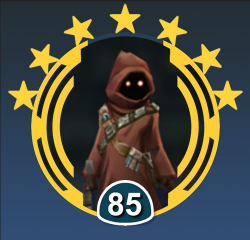 Say it with me: Utinni! Obviously Jawas, followed by Tuskens. I don't know how to drive. Never had a single lesson, nor read a single book. I do know that only **** use their phone while driving, and that only big **** use their phone while driving to play a mobile game. I just hope that one day, if they add ghost versions of Ben, Yoda, and Anakin (and anyone else who might turn into a ghost), that they are immune to physical damage. I'm gonna regret saying that when I end up not getting one of the ghost characters. Or...you don't move mods around. I've always thought it was just what CG thought they should have. Thrawn, despite having no 'special abilities' like the force deals special damage? Because why not? Searching for Han also comes up with both Bastila Shans though. He wants to view his collection of just Hans. I usually get Lando Falcon blueprints every time it comes back. I have his Falcon at 7* so they are not needed. Would gladly trade them for Phoenix blueprints. This made me laugh. A little light for the impending darkness of the Malak event. They know that we've had too much KOTOR crap right? I'd even take Sequel content over anymore KOTOR stuff.